Stockholm has a lively drinks and restaurant scene. Nevertheless, the city is fairly small and consequently the number of trade and tasting events that occur here are quite limited. Earlier this month, however, not only one but two tasting events took place in the same week – luckily not on the same day. Each set up was totally different in style to the other. The first event was organised by Lars Torstenson and his team at Terrific Wines. A charismatic, maverick Swedish winemaker, he spent many years in the South of France producing idiomatic wines. Nowadays, as well as making wine, he consults all over the world and imports wine to Sweden. And he writes, quite a bit, mostly books on wine. He also publishes a daily blog (www.vinifierat.se), humourous, rock’n’roll, at times irreverant yet topical. In the second week of March he showcased a selection of his wines. He did better than that however, he invited winemakers along to present them. He may also be promoting women and wine, or maybe he simply enjoys women’s company, who knows: all of the chosen winemakers were women. Terrific at that, as were the wines. The programme started off with an introduction from Louise Sydbeck on her journey to becoming Sweden’s 3rd Master of Wine. This was followed by a presentation on Skype from Andrea Mullineux, winemaker at Mullineux Family Wines, Swartland, South Africa. Andrea and her husband Chris Mullineux are part of a small group of winemakers which include amongst others Eben Sadie and Adi Badenhorst that have brought attention to Swartland. Swartland, literally black land, owes its name to its indigenous rhino bushes (renosterbos) that turn black during the summer. Located an hour’s drive away from Cape Town, the region is primarily agricultural (wheat) but has 13’509 ha of vines. Swartland is South Africa’s fourth biggest wine region, after Stellenbosch (1st), Paarl (2nd) and Robertson (3rd), with 13.55% of total hectares of vines (figures for 2013 from SAWIS annual statistics at http://www.wosa.co.za). Andrea, a trained oenologist from California, explained how she came to South Africa 11 years ago for an internship and fell in love with the country. She met her husband whilst working in the Rhône Valley and both are passionate about Rhône varietals. She and her husband worked at Tulbagh Mountain Vineyards (now Fable Mountain Vineyards) but in 2007 they decided to set up their own winery. As a young couple starting off they did not have sufficient funds to buy land and plant vines. Instead they took over some old vines and brought them back to life. Their vineyards lie on soils of schist and granite and on the tiniest patch of iron, and are some of the most ancient viticultural soils on earth, formed over 550 million years ago. With her hands still stained from grape processing, Andrea tells us how she is searching for purity of fruit and terroir in her wines. They have one red varietal, Syrah, with which they make four different wines. Three of the wines are made from grapes grown on one soil type only, i.e. Schist Syrah, Granite Syrah and Iron Syrah, with the fourth red a blend of all three soil types. Each wine is truly distinct from the other and a true expression of the soil type. On schist, water runs right off and the vines struggle. The berries are smaller and their skins thicker. The wines are masculine in style with more tannins and structure. Although the climate is mediterranean and rain falls only in the winter, the granite soils have a higher water table. The vines have a greater canopy and the bunches are bigger. Granite Syrahs are characterized by their perfume and elegance. Winemaking is as intervention free as possible. Andrea strives to make wines with structure – the key to longevity – and wants “texture that will age and not structure that will integrate”. She thus favours whole bunch fermentation and can leave the stems and skins on the juice for up to six weeks. She does not fear extracting too many tannins as she says that over time they soften and that in any case Swartland tannins can sometimes be too supple. She likes using bigger barrels such as 500 litre and 2000 litre foudres as she is interested in the wood for ageing and not for flavouring her wines. Wines mature between 9 and 18 months in wood. They are bottled unfiltered and unfined. Winemaking will of course vary from vintage to vintage, but within the same year each wine be it the Schiste, Granite or Iron will be vinified in the same way to let the expression of terroir shine through. Mullineux Syrah 2013 tasting note: Dark raspberry in colour, gem-like luminosity, liquorice, raspberry sweets, freshness, elegance, supple, dry and long finish (ed.). 2013 was a cool vintage with long slow ripening which produced very aromatic wines. Andrea also mentioned that the stems were very ripe making the wines taste cooler. Mullineux Schiste Syrah 2012 tasting note: Beautiful pinkish/plum colour, dense sweet raspberry fruit, blue fruit, plum, refreshing acidity, silky body, long dry and focused finish (ed.). Mullineux Granite Syrah 2012 tasting note: Violets, a little baked fruit, white pepper, spice, fresh, light and elegant, long mineral finish (ed.). Mullineux Syrah Iron 2012 tasting note: Earthy and rich, a little rustic, toasty with dark fruit, peppery tannins, fullness on the mid-palate, good acidity, dry finish (ed.). Andrea likes her wines to be fragrant with a spicier palate for enhanced aromatics. Indeed, all these reds were characterised by their expressive aromatics, freshness, fragrance, structure and lightness in body. 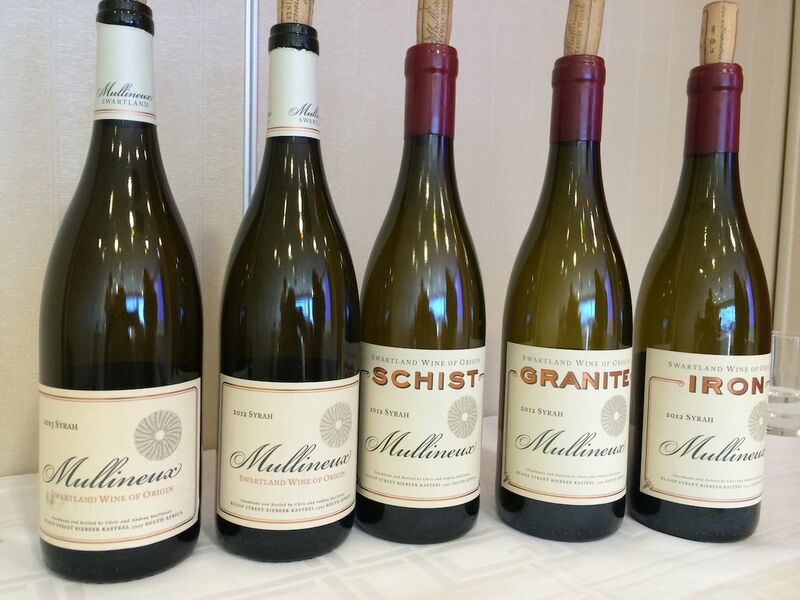 When the Mullineuxs first started making these wines in 2007 the trend was for bigger and bolder wines. Now, however, tastes appear to be changing and although they are “not making wine for the critics, critics like their wines”. In 2014 they were voted best South African winery of the year. The next seminar was given by Clotilde Davenne who travelled over from Burgundy. A trained oenologist she worked for many years at Domaine Brocard in Chablis before setting up on her own. She is based in Préhy, just south of Chablis. Her vineyards are spread over a few communes including Chablis, St-Bris and Irancy. She produces quite a range of wines: red wine from Pinot Noir (Irancy), white Sauvignon Blanc (St-Bris), Chablis Premier Cru, Chablis Grand Cru, Chablis, Petit-Chablis and some sparkling Crémant de Bourgogne (rosé and white). Also in her portfolio is white, Aligoté and red Bourgogne. The wine she presented was her Bourgogne Blanc. The grapes that go into the making of this wine come from vines situated near Préhy, bordering the Chablis appellation. They are at an elevation of 340m on kimmeridgian soil. 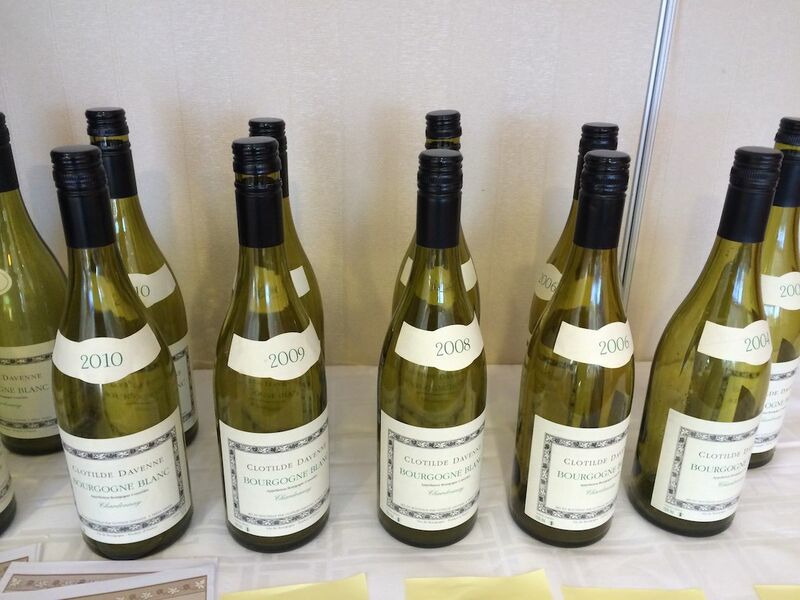 Although not in the Chablis appellation, the style of the wine is in keeping with Chablis. It is fresh, pure, mineral and citrusy but with a softer, rounder palate. The wine is of excellent quality and very good value for money. The grapes are harvested two weeks later than those from her other vineyards. The harvest is carried out by machine (ed. a clear demonstration that quality wine can be made from mechanically harvested grapes). The grapes are pressed as soon as they reach the winery. Racking (débourbage) for Clotilde is an important step: if too much solid matter is removed from the juice the fermentation will not have sufficient support, but if too much is left in, the final wine will not be elegant. Fermentation is spontaneous with no added yeast and there is no use of oak. After the first fermentation the wines go through malolactic fermentation, a process that gives complexity to the wines. Clotilde Davenne took us through different vintages, giving us a brief overview of the weather and its influence on her wines. 2012 was a classic vintage. There was a lot of rain and it was hard to stay organic. The rain stopped at the end of July. August and September were good. 2012 turned out to be a very good vintage for Chablis, producing wines with a nice acidity and concentration. The Bourgogne Blanc 2012 is fresh, citrusy, with a touch of butteriness and apples on the mid-palate. In 2010 the weather was nice throughout the year. There was just the right amount of sun and rain. The Bourgogne Blanc 2010 is characterised by good minerality, racy length and a little toastiness (ed.). Clotilde points to the taste of almonds indicating the wine’s ability to age. She adds that the citrus character has left as the wine is now going through a period of ageing. 2009 was a hotter vintage. Clotilde says that it is hard to tell how well the wines will age – acidity being the main component necessary for the ageing of white wines. Clotilde’s Bourgogne Blanc 2009 is rounder and fuller in the mouth than the 2010 and has notably less acidity (ed.). 2008 is an interesting vintage. It was a difficult year. The month of August was awful. It was very cold. The grapes were harvested at the end of September, as in the past. The acidity was very high. The malolactic fermentation took place late, in May and June. The wines turned out to be amazing but were very closed in their youth. The Bourgogne Blanc 2008 is round on the palate with toasted notes and a long length (ed.). In 2006 the summer was not particularly good and Clotilde started harvesting earlier. Her Bourgogne Blanc 2006 has a pronounced nose of yellow apples and soft, fleshy apples on the palate. We were not poured the 2013 Bourgogne Blanc. This wine is on the shelves at Systembolaget (SB 5562) for SEK 127. Young, fresh, pear, grapefruit and peach on the nose and on the palate zesty lemon, high acidity, fleshy minerality and good length (ed.). Clotilde’s outlook for the future of wine growing in Chablis is not hugely optimistic: every year 10-15% of her plants die and have to be replaced. The diseases that afflict them include Flavescence Dorée, Bois noir and Esca, for which there is currently no cure. Climate change of course is the main worry. Will Chablis winemaking be able to continue relying on naturally produced acidity in the grapes? Also from Burgundy but producing a different style of wine is Françoise Feuillat-Juillot. She bought her 14ha estate in 2004 and since then has been putting her personal stamp on the wines the estate produces: as well as being the winemaker she manages the vineyards. This she does in lutte raisonnée (Integrated Pest Management). The estate is located in the south of the Côte Chalonnaise, which has the Côte de Beaune above it and the Mâconnais below. 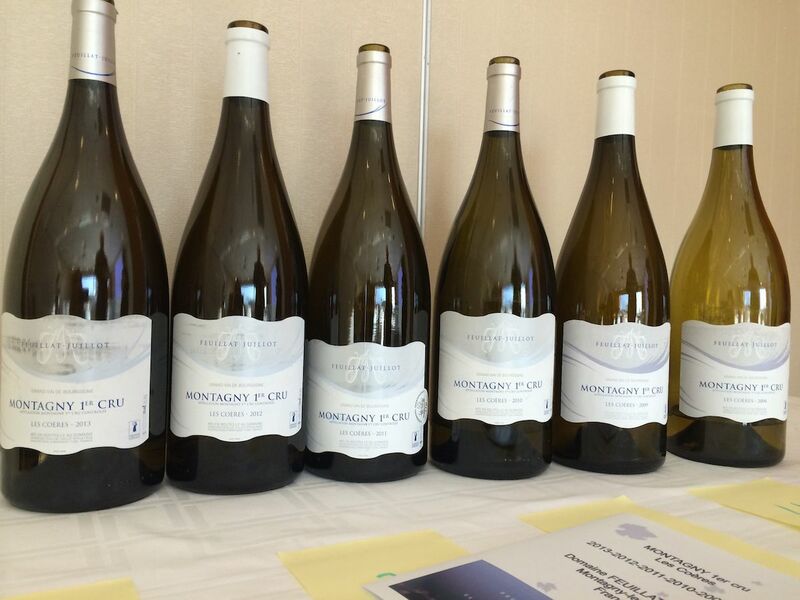 Of her 14 hectares, four are them are Montagny Premier Cru, Les Coères. The vineyard is 60 years old, well situated, on an east/south-east facing plateau at an altitude of 300 m. Oak barrels are used for both the alcoholic and malolactic fermentation. 10% of the oak barrels are new, 50% are 1 to 2 years old and 40% are 3 to 4 years old. The hallmark of Montagny is its mineral character. 2013 Montagny 1er Cru “Les Coères”, Domaine Feuillat-Juillot. Tasting note: Delicate aromas of lime, grapefruit and white flowers. Fresh acidity and minerality on the palate (ed.) Not a vintage to cellar. The winter was long, spring was cool with rainstorms in May. Weather was bad during flowering and fruit set which reduced the crop. Rain fell during the month of September making it difficult for the vignerons to choose a harvest date and obliging them to work fast and diligently to achieve quality. 2012 Montagny 1er Cru “Les Coères”, Domaine Feuillat-Juillot. Tasting note: Citrus fruit and a hint of vanilla on the nose, fresh and elegant on the palate with a little saltiness (ed.). The weather was bad at flowering and produced small berries. On the 30th of June a huge storm struck the area. Yields were low – Françoise produced less than half her average yearly amount of wine – but there is quality. Wines have a good concentration. 2011 Montagny 1er Cru “Les Coères”, Domaine Feuillat-Juillot. Tasting note: Fresh, floral nose, white and yellow peaches. Cooked pears, almonds on the palate and a long length (ed.). Spring came early and was very warm and caused vine development to be three weeks early. Summer brought chaos with cold temperatures (one of the coldest summers of the last 20 years), rain and storms including hail in July. Production was not very big. In fact the crop for 2012 and 2011 put together corresponded to that of one average year. The wines displayed nice minerality and acidity but needed bâtonnage (lees stirring) to get more concentration. 2010 Montagny 1er Cru “Les Coères”, Domaine Feuillat-Juillot. Tasting note: Delicate and refined, citrus and lime on the nose, good acidity on the palate with a light and fresh body (ed.). A very good vintage for Burgundy, a “classic” vintage, that produced wines of great purity and freshness. 2009 Montagny 1er Cru “Les Coères”, Domaine Feuillat-Juillot. Tasting note: Powerful nose, ripe citrus and on the palate balanced acidity, round body, toasted almonds, baked apple pie, long length (ed.). Weather conditions were good throughout the vine’s growing season. The seasons were as expected. Temperatures were high during August and September. Yields were good and quality was exceptional. Françoise did not do any bâtonnage (lees stirring) on her wines as length and complexity were already there. A beautiful vintage deemed a real success in Burgundy. Wines have a good ageing potential. 2004 Montagny 1er Cru “Les Coères”, Domaine Feuillat-Juillot. Tasting note: Ripe fruit on the nose, good acidity, white flowers and pear on the palate. A year where yields had to be controlled with ébourgeonnage (bud removal) in the spring and green harvest in the summer. Mixed weather during the summer with hailstorms that damaged the vines. Slow maturation. Warm and dry month of September. Acidity came out high in the wines and bâtonnage (lees stirring) was necessary. Wines from this vintage are a little like those from 2010: very pure but with a medium length on the palate.